Your current smartphone's processor may be fast, but Qualcomm is hoping to show you a whole new definition of mobile performance. On Tuesday, the company staged a benchmarking exhibition in San Francisco to demonstrate the raw speed of its Snapdragon 800 chip, designated for "premium" smartphone deployment later this year. Qualcomm already has a footprint in many of the top handsets. The 400 series of chips is included in both the HTC One and the Samsung Galaxy S4, for example. Qualcomm hasn't announced which phones and tablets will use the 800 series, but, for what it's worth, the company showed off the new chip using the 700MHz LTE band that's specific to AT&T--although that means little at this point. When Qualcomm first announced the Snapdragon 400 and 800 chips at the Consumer Electronics Show this past January, the company said the 800 series will appear in "premium" mobile devices in the second half of the year and provide as much as a 75 percent performance boost over Qualcomm's current Snapdragon S4 chip. The 800-series chips include a quad-core CPU, known as the 28-nm Krait 400, with each core running at up to 2.3 GHz. It has a new Adreno 330 GPU, integrates a 4G LTE modem for data rates of up to 150 Mbps, and supports the 802.11ac WiFi standard. 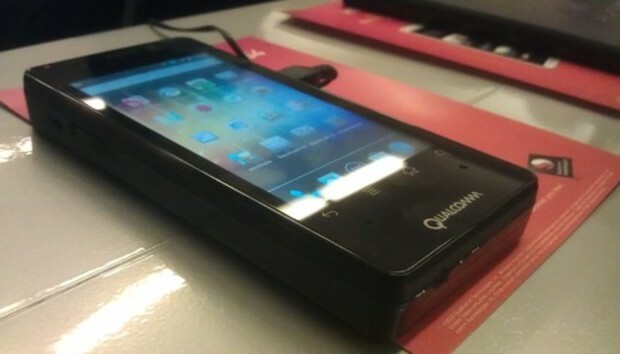 In the San Francisco press event Tuesday, Qualcomm showed off the new chip in mobile development platforms (MDPs), and gave reporters a chance to run several benchmarks on this purpose-built hardware. Not surprisingly, the Snapdragon performed swimmingly, with games like "Need for Speed: Most Wanted" running perfectly smoothly. "Epic Citadel," a tour of a medieval town powered by Epic's Unreal Engine, also ran with nary a judder, and generated an average frame rate of 59.7 frames per second at 1920-by-1008 resolution. For what it's worth, tests reported the SnapDragon 800 as a 2.27 GHz chip paired with 1.83 GB of memory. Hitting 60 frames per second in the Unreal Engine sounds great on paper, but Jeff Bier, president of embedded processor analyst firm Berkeley Design Technology, points out that numerical performance benchmarks are becoming less relevant. The most useful benchmark? One that gauges power consumption, the measurement that couldn't be qualified via benchmarks during Tuesday's testing regimen. Regardless, using the 1.0 version of the SunSpider benchmark, Qualcomm's chip spit out results of 782.0 ms, 802.8 ms, and 821.2 ms, with an average score of 802 ms.
What are those high performance numbers good for in real life? Raj Talluri, senior vice president of product mangement for Qualcomm, said that OEMs could use the processor as "computational cameras," providing the software equivalent of the Lytro post-focusing camera technology for phones and tablets. The new Qualcomm processors will compete with Nvidia's Tegra 4, Samsung's Exynos 5, Apple's A5 and A5X, and Intel's Atom chips. At this point, the Snapdragon 800 looks like a potential winner when it's released this fall. But doesn't everything, many months before it actually appears in shipping hardware? The real questions will be answered when the Snapdragon launches against its competition, and we get a better idea of its battery life.